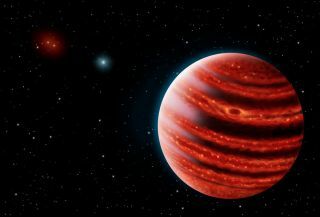 An artist's conception of exoplanet 51 Eridani b, which resembles a very young Jupiter could help scientists write a new theory of planet formation. Over the last two decades, the discovery of thousands of exoplanets outside our solar system has shaken up old theories about how planets form;the recent discovery of an "infant Jupiter," rich in methane, may be one step toward writing a new one. A very young gas giant planet called 51 Eridani b, located 96 light-years from Earth, has a methane-rich atmosphere, just like Jupiter. This is a first, according to a statement from Stanford University: the handful of gas giant atmospheres that scientists have been able to study contain only trace amounts of methane, despite what scientists anticipate for those types of planets. Planets don't radiate light the way stars do, but they're not entirely dark, either. Planet 51 Eridani b, for example, burns at about 800 degrees Fahrenheit (426.6 degrees Celsius), which is hot enough to melt lead and give off a substantial glow. The heat comes from energy that was captured during the planet's formation process, which took place about 20 million years ago. Jupiter is closer to 4.5 billion years old, so by contrast, 51 Eridani b is a planetary infant. "It's young enough to remember how it formed," said Bruce Macintosh, principal investigator of GPI (which Macintosh pronounces "gee-pie," but which some of his colleagues pronounce "gee-pee-eye"). "The details of its formation process affect how bright it is." The GPI instrument was designed to search for young gas giants. It directly detects the light radiated by these hot, young things, whereas the Kepler Space Telescope (which has identified more than 4,000 planet candidates), finds planets by watching for the dip in the brightness of a star as the planet passes in front of it. "To detect planets, Kepler sees their shadow," Macintosh said in the statement from Stanford University. "The Gemini Planet Imager instead sees their glow, which we refer to as direct imaging." According to Macintosh, the brightness or temperature of a young planet could reveal how that planet formed. There are two key ideas as to how massive gas planets form: fast or slow. The fast-formation method suggests that the material rapidly coalesces into a hot, mixed-up ball of gas and solid material, Macintosh said. By contrast, Jupiter is thought to have formed via the slow formation process, which starts with the gradual buildup of a rocky core, followed by the rapid accretion of gassy outer layers. If the latter process is very slow, it may stop short of gaining the gassy layers, and form a rocky planet like Earth. "Planets are not as bright if they form slow. If the planet forms fast, then a lot of energy gets trapped inside it," Macintosh told Space.com. "If you measure the brightness of a planet, you can maybe tell which formation pathway it follow." According to the statement from Stanford, other Jupiter-like exoplanets discovered thus far have been "much hotter" (that is, brighter) than slow-formation models predict they should be. The GPI team hasn't yet made a definitive measurement of 51 Eridani b's brightness (to do this they must also measure its mass), but the detection of methane has raised the team's hopes about what this new, methane-rich planet will tell them about the formation of other, Jupiter-like planets in the universe. Macintosh said it is possible that both the fast and slow formation processes take place in the universe. If that is true, he said, then scientists will want to understand how frequently each process tends to occur, because that would also influence how frequently small, rocky planets form. : Discovery image of the exoplanet 51 Eridani b was taken in the near-infrared light with the Gemini Planet Imager on Dec. 21, 2014. The bright central star has been mostly removed to enable the detection of the million-times fainter planet. The GPI instrument is about the size of a subcompact car, and rests on top of the 8-meter Gemini South Telescope in Chile. It is built to specifically study young gas giants like 51 Eridani b.
Twenty years ago, planet scientists had what seemed like a solid model of planet formation, Macintosh said, before telescopes revealed a whole swath of exoplanet solar systems that evolved very differently from our own. The old model couldn't explain, for example, how massive gas giant planets could be located extremely close to their parent stars, and yet that kind of arrangement has been found with some frequency. With an updated theory of planet formation, Macintosh said, scientists have a better chance of using such a model to help them search for more planets, including rocky, Earth-like ones. "Once that model traces the top of the iceberg, the visible part, then you can see what it predicts about the invisible parts of the system. The planets you can't see," he said. A better model of planet formation would also, in theory, help scientists better understand systems that contain planets that sit on the border between gaseous and rocky: those that could be either "super-Earths" or "mini-Neptunes." A planet formation model would provide information about which types of planets are more likely to form, under what conditions, and what other indicators might be present that could help scientists determine a planet's makeup. The GPI instrument will never be able to see rocky planets directly ­— they would be far too small and too dim. But many of the instruments that GPI uses to find young gas giants might be added to the Wide-Field Infrared Survey Telescope (WFIRST) space observatory, set to launch in the mid-2020s, which will study dark matter and search for exoplanets. As such, GPI is serving as a test bed for some of those technologies, and is paving the way for more direct hunts for Earth-like planets that may host life.